The Guardian’s Peter Beaumont has reported the following. It presents unambiguously the legal position that we and others have emphasised. 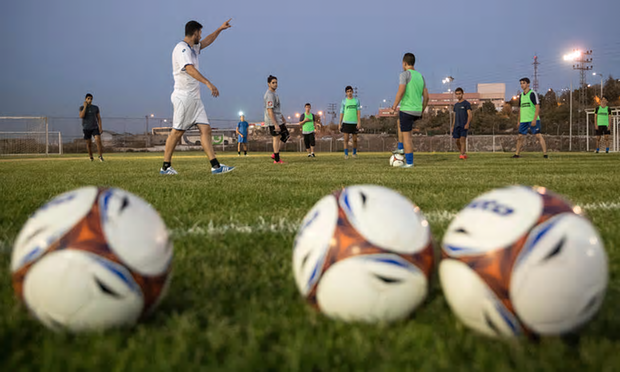 (Photo of the Aroni Ariel football ground is by Jack Guez, AFP/Getty images). “A senior United Nations official has written to Fifa to reiterate that the UN regards Israeli settlements – and by extension Israeli football teams that play in them – to be “without validity” and “illegal under international law”. Wilfried Lemke, the UN special adviser on sport for development and peace, said all clubs playing in Fifa-recognised competitions should abide by its statutes – a demand being invoked by pro-Palestinian campaigners who want six settlement clubs to either relocate to Israeli territory or be banned from Fifa competition. Last year a Fifa committee headed by South Africa’s Tokyo Sexwale was set up to consider complaints against the Israel Football Association (IFA), including the fact that settlement teams play in the occupied territories, apparently in breach of Fifa’s own statutes. Sexwale sought the UN’s opinion on the situation and the advice is contained in a letter sent to him on 7 October and seen by the Guardian this week. Settlement clubs are due to be discussed at a Fifa meeting on Thursday and Friday. Fifa’s president, Gianni Infantino, said earlier this month that finding a solution to the dispute over Israeli clubs playing inside the West Bank was a priority before next year’s football world congress. Six Israeli football clubs based in illegal settlements in the occupied West Bank play in the lower Israeli leagues but on Palestinian land without the permission of the Palestinian Football Association (PFA). Adding that he hoped the issue could be resolved through negotiation, Lemke said: “The United Nations security council has determined that Israeli settlements in occupied territory have no legal validity, as they are in breach of international law, and that such practices are an obstruction to achieving a comprehensive, just and lasting peace in the Middle East. “The UN recognises sport as a fundamental human right and, as such, it advocates and facilitates the realisation of such a right by everyone. Without undermining the right of Israeli and Palestinian people to sport, all teams playing in recognised Fifa competitions should abide by the laws of the game. Sexwale’s committee was set up after the collapse of a Palestinian initiative at last year’s Fifa congress to have Israeli football suspended over a variety of issues. The Israeli Football Association has been resisting efforts to have settlement clubs relocated to Israel or banned from competition. A Human Rights Watch report published in September argued that “settlement playing grounds, including one indoor hall, are built on land that has been unlawfully taken from Palestinians”. It said financial documents it had reviewed showed the IFA was engaging in business activity that supported the settlements and that “the clubs provide services to Israelis but do not and cannot provide them to Palestinians, who are not allowed to enter settlements except as labourers bearing special permits”. More than 150,000 people have signed an online petition calling on Fifa to act, and dozens of European MEPs have signed an open letter on the subject. The IFA and the clubs involved say a ban on playing in settlements would punish children involved with the clubs, as well as the clubs themselves, and that Fifa has no authority to define what is Israeli territory.